Scitech is a multi-disciplinary design, construction and consultancy company specialising in the pharmaceutical, biotechnology, life science and technology sectors. It employs 130 staff across its operations in the UK, The Netherlands and Belgium. Scitech has worked closely with Bespoke HR on an ad-hoc basis for the past three years. Based on the success of this relationship and the quality of the work delivered, in February 2017 Scitech opted to upgrade its outsourced HR service to a fully partnered ‘retained plan’. There are many benefits associated with retained plans, and for Scitech this included placing one of Bespoke HR’s consultants on site to carry out the role of an in-house HR Manager. Founded in 2002, Scitech became an Employee Benefit Trust in 2012, whereby the Board of Trustees manage the company for the long-term benefit of all employees, ensuring Scitech remain independent, with no external backers and no debt. This was a huge step forwards for internal engagement. However, since inception, Scitech has experienced substantial growth and to sustain and build on this growth the company needed to ensure that all employees were fully re- engaged to retain talent and to keep recruitment costs at a minimum. Whilst Scitech has good retention rates, and low staff churn, it had reached the stage in its development where informal staff processes and feedback mechanisms were no longer adequate for a company of its size. Staff feedback was being gathered anecdotally and senior management didn’t want to lose the connection which had always been part of the company’s ethos. As part of the thorough HR audit carried out with Scitech in early 2017, Bespoke HR recommended a staff survey to obtain feedback and insights on how employees felt about the business and certain aspects of their work. Not only would this flag any potential issues, but soliciting feedback from staff has been shown to increase engagement and improve morale and can help to provide an action plan for optimising HR processes in the future. 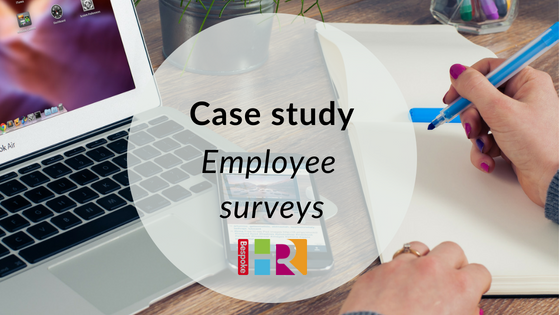 Bespoke HR created a client-specific ten-minute anonymous online survey based around the key drivers of engagement: leadership, teamwork, customer orientation, training and development, pay and benefits. It was distributed to all employees who were given multiple choice answers. 82% of employees in the UK and 85% in Europe completed the survey. These results were then analysed and presented to the management team by Bespoke HR, who determined success areas and points for improvement, and worked with the management team to create an action plan. The team took away several prioritised actions to complete within a 6-12-month time frame, which addressed improvement areas flagged by the survey. To present the findings to staff, an internal communications programme was launched and spearheaded by the Managing Director. A survey results poster was distributed and displayed throughout the business highlighting the findings, both the strengths and key areas management were committed to improve upon. The effects were felt immediately within the business, and staff reported they felt appreciated, listened to and more motivated following the survey. Using the survey and its results as part of its application to the Construction Enquirer Awards 2017, Scitech went on to win ‘Best Specialist Contractor to work for under £25m Award’. This win has further boosted staff morale and reinforced the message that Scitech is a good place to work, which is key for attracting new talent and the retention of existing employees. In addition, the accompanying publicity from the award win, run by UK Construction Week, has prompted positive feedback from Scitech’s own supply chain and generated interest from potential new clients. Find out more about how we can help your business with a HR healthcheck.